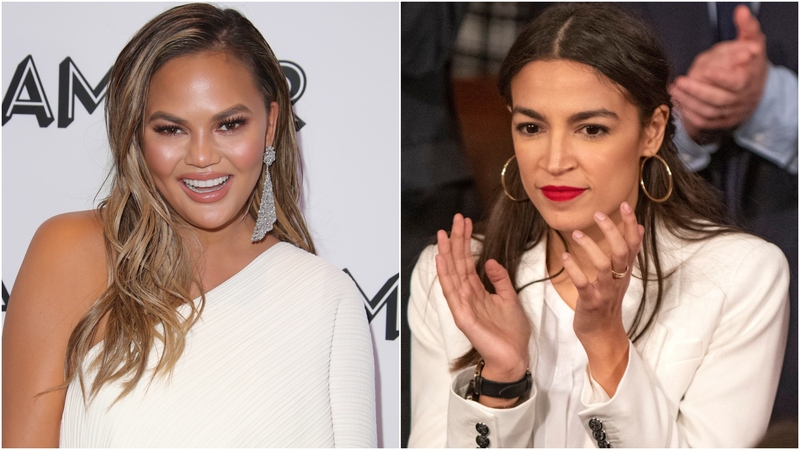 In important world news this week, queen of social media Chrissy Teigen did something that has the internet abuzz: She reached out via Twitter to New York congresswoman Alexandria Ocasio-Cortez and invited her to hang out over the weekend. Suffice it to say, the Twittersphere — including a few fellow celebrities — had thoughts. And by that, we clearly mean intense waves of alternating euphoria and jealousy. 🙋‍♀️ can I bring some 🍰?! While Teigen doesn’t explicitly spell out why Ocasio-Cortez is her hero, she retweeted a video on Feb. 7 that showed Ocasio-Cortez making a point about political corruption at the House Oversight Committee. The youngest elected congresswoman, Ocasio-Cortez has been generating quite a bit of attention for her bold approach to addressing perceived flaws in the political system, from the country’s failing health care system to policies on climate change. Ocasio-Cortez’s no-holds-barred personality is already drawing comparisons to other groundbreaking women in politics, such as Ruth Bader Ginsburg. At this point, it remains to be seen whether Ocasio-Cortez really will join Teigen, Teigen’s husband John Legend, Ferguson and anyone else who might be attending this magical Grammys pizza party. But we wouldn’t be surprised if just as many people tune in to Twitter as they do to the Grammys in order to find out.